Western blot analysis of extracts from various tissues using α-Smooth Muscle Actin (1A4) Mouse mAb (IF Formulated) (upper) and GAPDH (D16H11) XP® Rabbit mAb #5174 (lower). 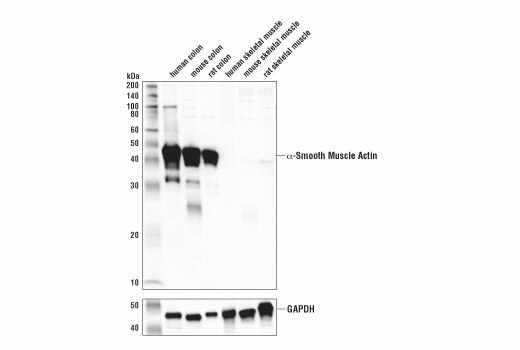 As expected, skeletal muscle samples are negative for α-smooth muscle actin. 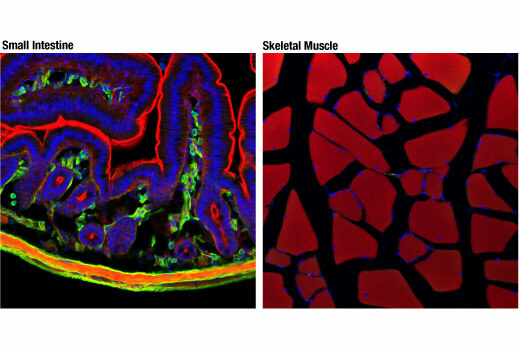 Confocal immunofluorescent analysis of mouse small intestine (left) or skeletal muscle (right) using α-Smooth Muscle Actin (1A4) Mouse mAb (IF Formulated) (green). Actin filaments were labeled with DyLight™ 554 Phalloidin #13054 (red). Blue pseudocolor = DRAQ5® #4084 (fluorescent DNA dye).